From a fantasy manager’s viewpoint, Saturday wasn’t supposed to generate many points. The top EPL teams were poised to play Sunday with Spurs hosting Palace, while Arsenal visited City and Jose returned to The Bridge to face Chelsea. However, Saturday did set the tone for the weekend and points were tough to come by. 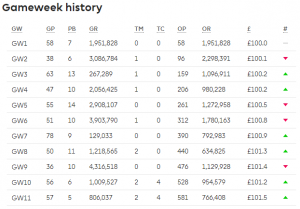 Much like GW10, I made the decision to take another -4 point hit, as I am in the process of moving to a 5-man midfield with premiums Eden Hazard, Christian Eriksen and Mohammad Salad. Risking the potential of a big return, I did not captain Harry Kane, which turned out to be a good move. 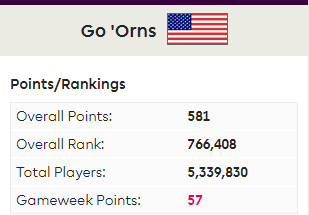 I finished the game week with a green arrow on 57 points and moved up 188k to 766k in the overall rankings. Starting the week, I mentioned that Harry Kane, “was becoming essential in the starting XI” in the article, Captain’s Armband: GW1-10. After his lackluster, 77 minute performance on Sunday against hapless, Crystal Palace his position in the starting XI isn’t essential. His home performances, outside of the 16 point return against Liverpool in GW9 has been terrible. A total of 8 points at home to: Burnley, Swansea City, Bournemouth and Crystal Palace doesn’t illicit confidence at Wembley. At £12.6 his price just doesn’t justify his returns. Sergio Aguero (67 points), at £11.8, has matched Kane’s (65 points) goal output with 8 to go along with 3 assists (2 more than Kane). Romelu Lukaku sits a point behind Kane on 7 goals and 3 assists, but has gone goalless in his last 7 games (all competitions). Recently, there is no clear cut answer as to which player has the advantage up front. Based on Kane’s poor home showing (outside of Liverpool) I made the decision midweek not tap him with the captain’s armband, instead giving Richarlison a chance at redemption. It was a week that was clear cut for captain duties, Kane against Crystal Palace seemed tailor made for a big return. It bombed, Kane didn’t return. Mohammad Salah was another option against a struggling West Ham, he returned 2 goals, thanks in part to the return of Sadio Mane (2 assists). However, Richarlison’s away from has been star studded and I decided to give the Watford man the shot at glory. He didn’t fail, just 2 minutes out of half time and Richarlison struck to give the Hornets a 1-0. He lost out on an assist after being taken down in the penalty box, 10 minutes into extra time. Unfortunately Tom Cleverly missed. Richarlison still finished the day on 14 points and didn’t disappoint. In the midfield it was Mohammad Salah that impressed. The return of Mane to the starting XI for the Reds means his attacking returns could be returning to prominence as Liverpool have a sea of green through the end of December minus Chelsea in GW13 and Arsenal in GW19. Salah finished the day with 2 goals, to give him 7 on the season and 3 bonus points for 15 points. 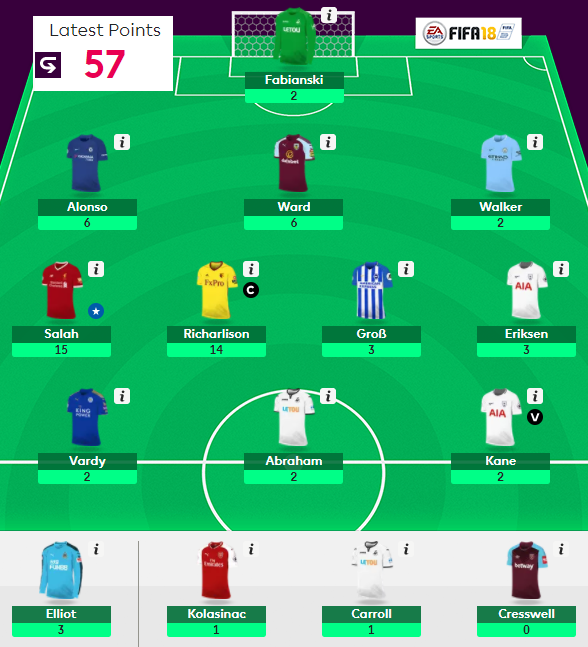 He, along with Richarlison carried my squad with 29 points, as Pascal Groß and Christian Eriksen failed to return. For Eriksen, this is his third game in a row with no returns but fixtures are strong through Gameweek 24! With just Arsenal out of the international break and a visit to Man City in GW18, there should be many opportunities for big returns. Should be! Defensively, I opted for a 3-man defense, benching Aaron Cresswell and Sead Kolasinac. The Gunner’s wingback looked dangerous in the first half, but finished on just a single point, while Cresswell failed to return. City’s defense still appears suspect, giving up a strike to Alexandre Lacazette to lose the clean sheet. Kyle Walker was in fine form with a number of good crosses, but none that resulted in an attacking return. At £6.5 he’s essential for Man City and as an anchor in my defense. Hopefully the 1-0 Chelsea win over United was a turning point for the Blues as they have continued to struggle defensively. On the season Marcos Alonso recorded just his 4th clean sheet, two in the last two but still hasn’t put together attack points since GW2. Priced at £6.9, he’s £0.3 more than partner, Caesar Azpilicueta, who’s got a goal scored and 5 assists for 67 overall points, compared to 46 for Alonso. Even with Chelsea’s impending run of good fixtures (thru GW21), Alonso is already tagged to be moved to fund my midfield. Burnley’s Stephen Ward was well worth the investment last week as he picked up his second CS in as many games. His 12 points sets up nicely for a potential third CS as the Clarets host Swansea City out of the international break. I do intend on retaining Ward as Arsenal visit in GW14, as Burnley has bou/lei/WAT/STO/bha through mid-December. If there was any way to play a 4-6-0 formation, I would. Forwards have been nothing but a constant headache all season. Early on it appeared Lukaku was essential, top owned player in the FPL, returned 7 goals in the first 7 games. Since then, he’s gone goalless in the last 6 games (all competitions). Harry Kane broke duck in September, after a dismal August and the “woodoo voodoo” that saw him post great stats but not convert. Now, he’s clicking…away from Wembley, but struggling at home against weaker opponents. As for Aguero, he was my “man crush” and thought of him as a “must have” in season’s past. This year, he’s being platooned with Jesus and has finished just 4 games (injured for 2 games). At £11.8, I have a hard time with a player who won’t play 90 minutes week in, week out. By all appearances, Gameweek 11 was the final week starting 3 forwards; Harry Kane, Jamie Vardy and Tammy Abraham. None of them returned, totaling just 6 points. 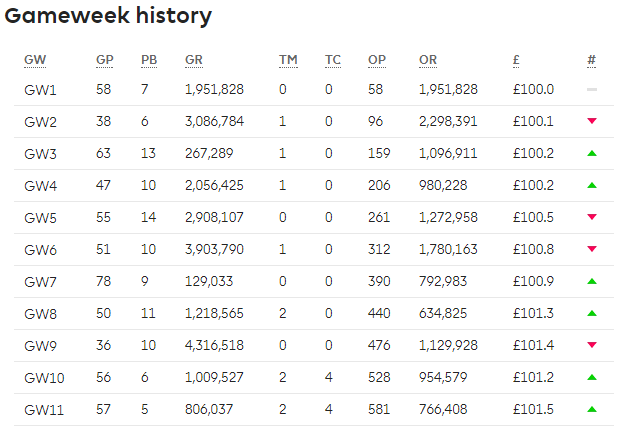 Thankfully, I stuck to my guns and didn’t captain Kane, which was a swing of 12 points and the difference between a green and red arrow this weekend. Vardy, like the aforementioned Alonso is on the way out to bolster my midfield. Abraham was brought in last week as a budget option, but I don’t expect him to feature in many games, but should help through the holiday period. With the international break upon on, I go in with just a single FT and based on my planning it appears I will take another -4 point hit in order to reallocate funds, to finish building a starting 5-man midfielder by GW14. However potential injuries could derail during international duties could derail my advanced planning.